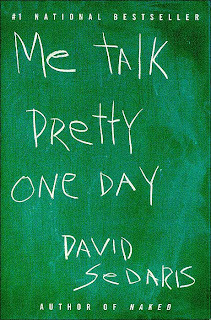 From trying to overcome a lisp as a child to struggling to learn French in his early 40’s, David Sedaris takes you on an amusing ride with his book of memoirs, entitled Me Talk Pretty One Day. Sedaris, an American humour novelist who is also a regular contributor to a public radio program called This American Life, moved to Paris and decided to take up learning the local language. This novel is what emerged, with many of the stories recounted from his time in France. It’s a great read, and at points laugh-out-loud funny. It has inspired me, as many things easily do, to pick up my old dusty book of French verbs and try to reacquaint myself with the language. Currently residing in Capital City I have unlimited opportunities to practice my skills, but like many things on the to do list, have yet to do anything about it. As I had mentioned in a previous post, my Papa is known for his great advice, my problem has always been following it. When I was in grade school he was very impressed that the school system was teaching us all French. In his time I think they taught Latin. Although he never came out and said it, I feel that it was his hope that one day I would be proficient enough in the language to teach him. What he always instilled in me was to keep up on my French skills, as one day I may need it. This is something pretty heavy to lie on an eight year old. He kept at it through the years and so did I. I in fact took French until my OAC year in highschool, but unfortunately retained none of it. Throughout my 10 years of learning the French language in school, my Papa repeated his advice, and I kept thinking ‘why, I’m never going to move to Quebec anyway’. And yet here I find myself years later still unilingual, approximately 600km’s away from home, living in the government town of government towns, in bilingual Capital City, thinking once again that I should have heeded my Papa’s advice.